If you have kids that need to get up and play when in a cafe, this Wellington institution is a good place to come. Although small and not fenced off, there’s an area between some of the tables that’s set up with toys and a little table and chairs for kids to play at. 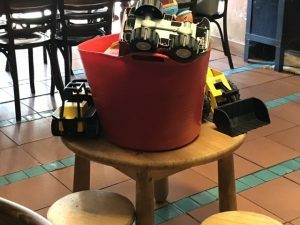 It’s probably best suited to preschoolers in terms of the toys provided but the cafe is generally very family friendly and the staff are tolerant of kids. There’s a full a la carte menu, daily specials and cabinet food which between them have lots of options for breakfast, lunch and morning/afternoon tea. There’s also a coffee menu and kids’ menu with items such as kids’ pancakes, a mini breakfast and chicken burger on it. The food is good and arrives relatively quickly, so even if you have to wait for a table (common at the weekend), you shouldn’t have to wait long once you’ve ordered. There are plenty of highchairs if you require one. Address: 27 College Street, Wellington. Paid parking on the street (free for 2 hours at the weekend). Open: Monday – Friday 7am – 4pm, Saturday 8am – 4pm, Sunday 9am – 4pm.